The 1917 Boston Store H801-8 baseball card set consists of 200 cards that measure 2" by 3¼". These 1917 Boston Store cards were distributed to promote Boston Store, a Midwestern department store headquartered in Chicago. The cards feature text in black ink on a sepia card stock. There are several of the 1919 "Black Sox" who have cards included in the Boston Store Set. Key Hall-of-Famers and other notable players included in this issue are: Shoeless Joe Jackson, Chick Gandil, Babe Ruth, Ty Cobb, Eddie Collins, Harry Heilmann, Walter Johnson, John McGraw, Sam Rice, George Sisler, Tris Speaker and Honus Wagner. 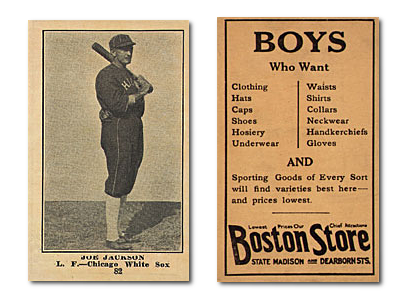 CLICK HERE if you want to sell your 1917 Boston Store H801-8 Baseball Cards.